Want to vote strategically? Here's a great tool. Build the movement to support refugees. The Unist'ot'en camp and community are on high alert. Support the camp. Take action if you want a debate on women's issues in the 2015 federal election. Vote Child Care 2015 brings together child care advocates and supporters from across Canada to promote the vision endorsed at the ChildCare2020 conference. The Ontario Health Coalition has prepared a voter guide focused on health care policy. 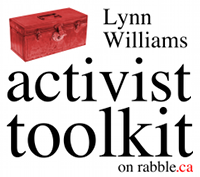 The Council of Canadians has created a voter's guide providing a summary of key issues for activists. The International Women's Rights Project has created a voters guide highlighting women's issues in 2015 election. Inclusion BC has created a plain language voter's guide for the 2015 election, to make the election process more accessible. Elections Canada prepares the voter guide in many language, including several aboriginal languages.